Almaty is the largest city in Kazakhstan. Situated at the base of the Tien Shan Mountains, Almaty is a verdant city, full of parks and fountains with fabulous views of the mountains. Upon arrival your guide and driver will meet you and you will transfer to the Otrar Hotel for a short rest before a morning sightseeing tour of the highlights of Almaty. The history of Almaty is rooted in the nomadic culture of the Saka-Scythian and Turkik Tribes. During medieval times Almaty was an important stop on the northern section of Great Silk Road. The modern history of the area, however, begins in 1854, with the construction of the Verniy Fort by Imperial Russia. Our morning jaunt will include the Russian Cathedral of Holy Ascension, the largest wooden church in the world and the Glory Memorial in Panfilov Park. 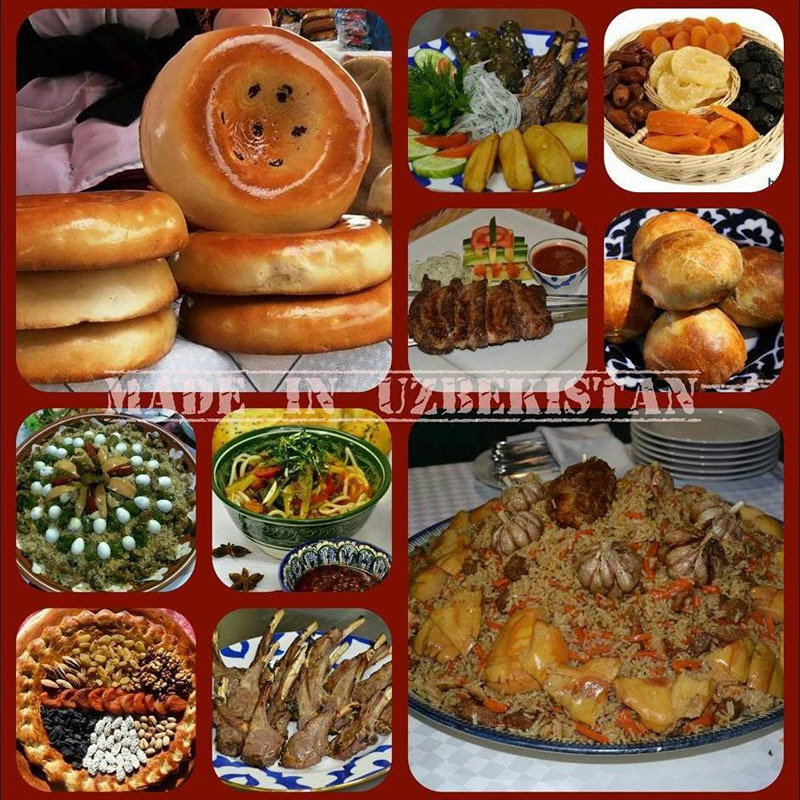 We'll explore the history of Kazakhstan in the Central State Museum, discover traditional music in the Museum of National Folk Musical Instruments and visit the vibrant Green Bazaar Market. Morning departure for the capital of Kyrgyzstan, Bishkek. After crossing the border, we will arrive in Bishkek, the "Hidden Switzerland" of Central Asia an intriguing mix of classic Soviet style and Asian and European influences. The capital of Kyrgyzstan, it lies in the Chui Valley of the Ala-Tau range in the northern part of the country. Watch the changing of the guards at Ala-tau Square, site of the 2005 "Tulip Revolution", relax among the outdoor sculptures in the shade of Oak Park, and even see one of the last (if not the biggest) statues of Lenin left in the region. Like other Central Asian cities Bishkek was originally an important trade center and caravan rest stop along the Silk Road from China to Europe. A local expert will give us some insight into the various uprisings in the last decade and the ethnic and political tensions which caused them. Accommodation will be at the Ak Keme Hotel, right in the center of town, with breathtaking views of the mountains and easy access to the surrounding area. After breakfast we will start on our way to Lake Issyk-kul, one of the most popular destinations in the country. Along the way we will visit the Burana Tower complex. 25 meters of the tower is all that remains of the 11th century city of Balasagun, the capital of the huge Karakhanid Empire and the tower presides over significant archaeological sites. 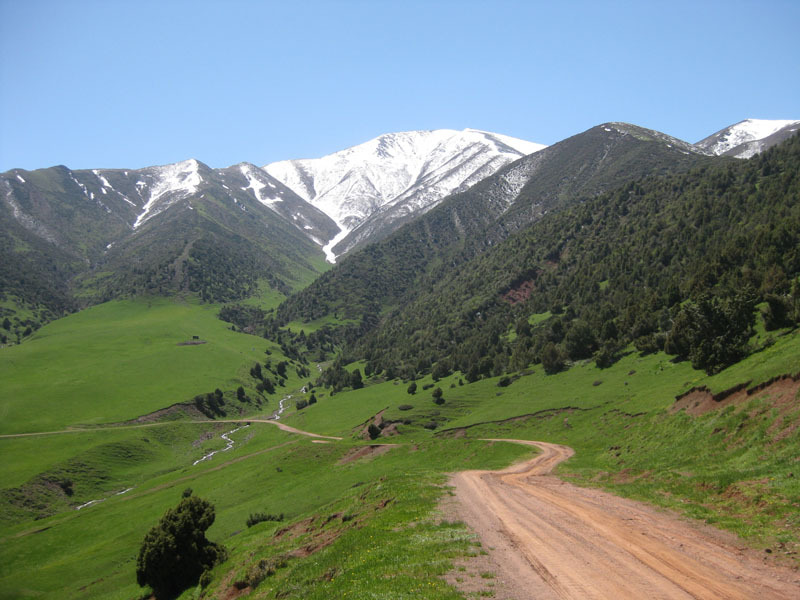 We will continue on to Lake Issyk-kul and the Karven Resort to enjoy the scenery and the unsurpassed Kyrgyz hospitality. Issyk-kul is a saline lake, the second largest high-altitude lake in the world. Issyk-kul means "warm lake" in Kyrgyz, as it never freezes. 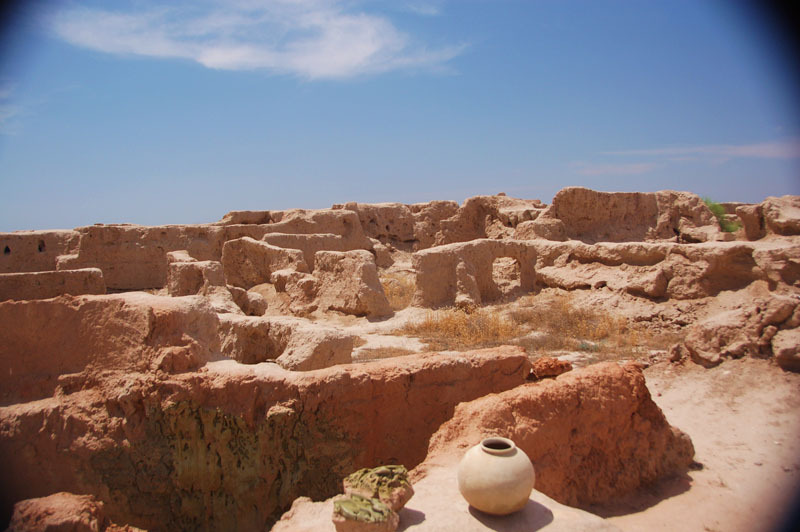 An important area environmentally, historically, and commercially, archaeological excavations in and around Issyk-kul have revealed evidence of ancient civilizations from about 2500 years ago. Today it remains a very popular resort area drawing visitors with its thermal springs, aquatic sports, hiking trails and abundant wildlife. The lush alpine meadows surrounding the lake are the domain of the golden eagle. Kyrgyzstan is a tapestry of unspoiled nature and breathtaking vistas in the environs of Lake Issyk-kul. We'll visit the picturesque gorge near the town of Cholpon–Ata. The local Ethnographic Museum details the ancient petro glyphs of the "Stone Garden" thought to be part of an ancient open-air temple. The Przhevalsky Memorial Complex here is the resting place of Russian traveler and geographer, Nikolai Przhevalsky, namesake of the famous wild horses of Mongolia. The Dungan Mosque is built entirely of wood and without nails and is one of the few which escaped Soviet destruction. We'll enjoy the rest of the day in this beautiful spot, driving back to Bishkek through the gorges and valleys. Off to the airport this morning to catch an early flight to Tashkent, Uzbekistan. Your Uzbek guide and driver will meet you at the airport to transfer to the Tashkent Palace Hotel. Tashkent is the cultural and economic center of Uzbekistan with 2000 years of history. A modern, fast-paced capital has developed around the ancient streets of the Old City as much of Tashkent was leveled in an earthquake in 1966. This afternoon's sightseeing will include a foray into the lives of students at the traditional religious medressah of Kukeltash, built in the 16th century. In the Old City we'll see the Hast Imam Complex consisting of the Barakkhan Medresah with its 7th century Koran (considered the oldest in the world), the Tello Shayh Mosque and the silver-domed Mausoleum of the Sufi Kaffal Shashi. Enjoy the life and color at the exotic old Chorsu bazaar, shop for souvenirs and watch craftsman at work in its pavilions. Once the artists neighborhood it was situated at the confluence of the roads through the city gates towards the routes of the Silk Road, and a bazaar developed here in the early middle ages. We will visit Independence Square and the Navoi Theatre. The elegant Navoi stands in the center of leafy Theatre Square and is home to the opera and ballet here, a building which blends European drama with Oriental design. Near the hotel is the seat of government at Mustakillik Square. Today we'll be following the Golden Road to Samarkand! We'll travel through the Malik Chul desert and stop at the "Iron Gate of Tamerlane" a gorge between two mountain ranges that allows access to the region. When we arrive in the fabled city of Samarkand we will transfer to our hotel. Samarkand is the second-largest city in Uzbekistan and is located near the border with Tajikistan. A UNESCO World Heritage Site, it has been a center of learning and culture in Central Asia for thousands of years. Likely founded around 700 B.C. by Persians, it was a contemporary of Rome, Athens and Babylon. It has seen rule by Persians, Greeks, Turks, Mongols and Russians, all who have left their mark on the city and its culture. Conquered by Alexander the Great in 329 B.C, he married the beautiful Roxana here and said; "Everything I have heard about Samarkand is true. Except that it is more beautiful than I ever imagined." Travelers still feel this way about the magical city. The famous ruler of Central Asia, Timur (known in English as Tamerlane) later rebuilt Samarkand and made it the capital of his empire, circling it with gardens and erecting splendid monuments. Exploration in ancient Samarkand includes a sightseeing tour to Registan Square, the main attraction of Samarkand and an impressive venue for the world's finest music festivals and national celebrations. Built around 600 years ago, this central square hosts three beautiful medressahs; the huge portals, domes and minarets decorated with glittering tiles can be seen from anywhere in the city. We will visit Ulugbek's Observatory, built in the 1420's with a giant curved track showing where his astrolabe was located. Ulugbek was Tamerlane's grandson, an important 15th century scientist, astronomer, architect and ruler. 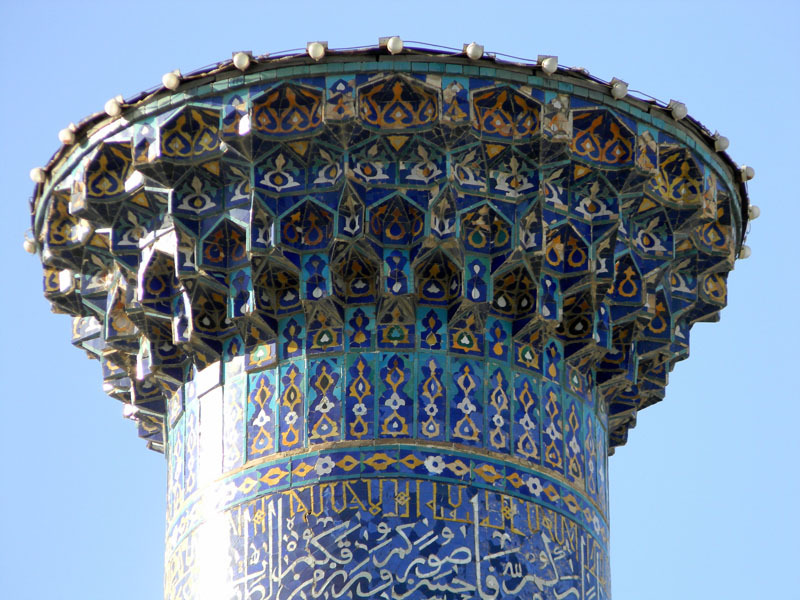 Samarkand has so much more to see; we'll start with the Guri Emir Mausoleum – Tamerlane's exquisitely designed and fabulously ornamented mausoleum. The work of hundreds of artisans brought from Persia, Iraq and India, it combines the styles of the Middle East and South and Central Asia. We'll follow with a visit to the historic Bibi Hanum mosque, and the fabulously tiled necropolis at the Shah i Zinda Ensemble. After lunch we'll get off the beaten track and visit the Hebrew Prophet Daniel's Tomb. His remains are said to have been brought from Iraq by Tamerlane. Here by the pleasant Siab River, are the Jewish Quarter and synagogue where we will learn about one of the largest Jewish communities of Central Asia. Then it's all about the art of weaving and embroidery at a silk carpet and embroidery factory where the owners have held the secrets of their dyes for seven generations. To round out the day we will visit one of the oldest wineries of Uzbekistan. It's all about ceramics today on our drive to Bukhara (270km). En route we will stop at the gate of an 11th century caravanserai and the Gidjuvan Ceramic center. Abdullo Narzulleav is a 6th generation master potter who established this center to maintain the traditions of regional ceramics. The center houses a museum exhibiting traditional tile work from Central Asia as well as workshops and facilities for visiting ceramicists. Our visit will include a lunch with the artisan's family. Bukhara is one of the most ancient and incredible cities in the world. Another UNESCO World Heritage Site, it began as a fertile oasis and developed into a center of science and culture over its 2500 year history. Its much-celebrated history boasts famous scholars, saints, scientists, artists, and architects. On arrival we will check in to our accommodation at Sasha and Son Hotel. Bukhara's impressive outer gates are partially intact and the city hosts a treasure trove of medieval architecture. Monuments from the 9th to the 20th century are preserved. We will start with a visit to the Labi Khaus Complex which dates from the 17th century when its mulberry-shaded pond was the principal water source. It is the cultural heart of the old city. The complex consists of the Kukaldosh Medressah – once the largest in Central Asia, the Khanaka (old merchant hotel) and Nadir Devan Begi medressah. We'll enjoy tea in an ancient chaikhana (tea house). Our sightseeing continues in the old city in the various trade domes for money changers, silks, carpets, puppets, jewelry and every cap and hat imaginable. We will visit the Magoki Attari mosque and the unique Abdulazizkhan Medreseh.The Poi-Kalon complex of mosque and medresseh surrounds the base of the greatest minaret of Central Asia. Standing 47 meters high, it has variously served not only as minaret, but as watchtower, landmark, and place of execution. This evening we'll enjoy a traditional folklore show. After breakfast we continue to explore the hidden gems of Bukhara. Our sightseeing starts with a visit to the seat of power of the rulers of Bukhara – the Ark Fortress. On an artificially created hilltop, the citadel of Bukhara was the seat of government for the city's rulers for over 20 centuries. At times housing up to 3,000 people, it has withstood repeated siege and destruction, the last being the Bolshevik bombing of 1920. Built during the reign of Tamerlane, the Chashmai-Ayub Mausoleum stands at the spot where the prophet Job is said to have struck the ground with his staff and a well with healing waters appeared. The 10th c. Mausoleum of Ismail Samoni is a true masterpiece of engineering and design. Legend has it that those who walk around the monument three times will have their wish granted! And what tour of the Orient is complete without a rose garden? We will find it at the magnificent summer residence of the emirs of Bukhara, the Sitorai Mohi-Khossa (Palace of Moon and Stars). The building now houses the Museum of Decorative Applied Arts, exhibiting the finest examples of applied and decorative arts from Central Asia. After breakfast we will drive to the Uzbekistan – Turkmenistan border to continue our journey. After breakfast we'll discover Merv, one of the most fascinating places in Central Asia. From the walls and mosques of historical Merv, caravans started towards Iran and Turkey. Once known as the "Queen of Cities", its ruins stand witness to history. Merv is Turkmenistan's most important heritage site with monuments and shrines from five different city-sites over three thousand years. Rumored to have been the inspiration for the "Thousand and One Nights" it was a center of learning and the arts under Arab rule. All this came to an end with the invasion of the Mongol hordes. Merv was destroyed again completely in 1795 by the Emir of Bukhara. The sheer number of ruins here is astonishing. We will explore the remains of the 12th c. Gyz-Gala fort, the conical ice houses, numerous medressah and caravanserai. The Sultan Kala, or medieval city arose outside the ancient fortified walls and it houses the mausoleum of Sultan Sanjar, one of Merv's great Seljik Turk leaders. It is the only element of the mosque and palace complex which has survived. In its time, contemporary writers said that its blue dome could be seen a day's ride away. Visit the Museum with its impressive displays of archaeological finds from sites excavated in the oasis and an informative and attractive display of fabulous Turkmen carpets, costumes and domestic equipment. See the whole city of Ashgabat at your feet from the top of the Arch of Neutrality. This capital city sits at the edge of the Karakum desert and was still a small village at the end of the 19th century, founded in 1881 as a military fort. Virtually razed in 1948 by a violent earthquake, today political and administrative center boasts modern architecture like the gleaming Kiptchak mosque. Turkmen carpets are legendary; sumptuously woven of wool, with its distinctive palette of deep reds patterned with traditional ghels – the symbolic motifs and talismans of tribe and region. 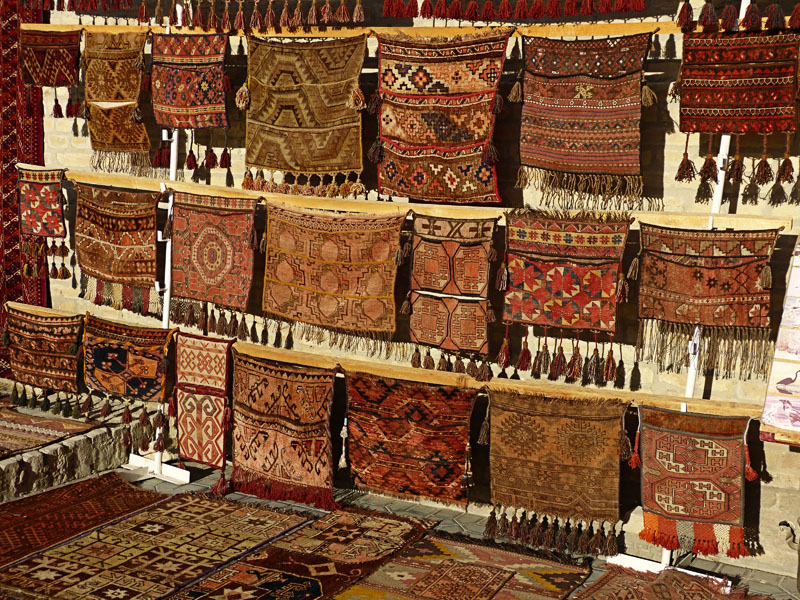 We will visit the carpet museum here with its displays of weaving and design. An entire section of the bazaar here is devoted to traditional Turkmen handicrafts including Kheteni silk, Zergar silver, the furry telpek hat, and of course, carpets! Our flight this morning heads north to Dahsoguz, where a short drive takes us to Kunya-Urgench. Another UNESCO World Heritage Site, it was the ancient capital of the Khorezmian civilization. At the crossing of two major caravan routes, it quickly developed into "the capital of a thousand wise men", luring scientists and poets alike. Destroyed by Genghis Khan in 1221 and Tamerlane in 1372-1388, it was rebuilt both times. In the 16th century it lost its capital function and fell into decay. Amongst the ruins are the remains of architectural masterpieces such as the mausoleum of Sultan Tekesh and the Kutluk Timur minaret. After crossing the border back into Uzbekistan, we'll drive to the city of Nukus. Set in the middle of the desert, it's an unlikely location for one of the most unique art collections in the world. During Soviet rule, avant garde artists were persecuted and their art destroyed. Igor Savitsky dared to amass a huge collection of this art in the far flung outpost of the former USSR. The story is one of the Cold War, of great courage, and the future of this treasure. In the afternoon we will drive to the fairy-tale city of Khiva, one of the most popular World Heritage Sites of the Silk Road. 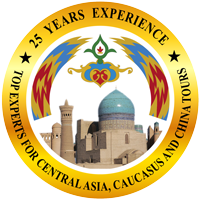 Accommodation, dinner and 2 nights' accommodation at the Asia Khiva hotel. 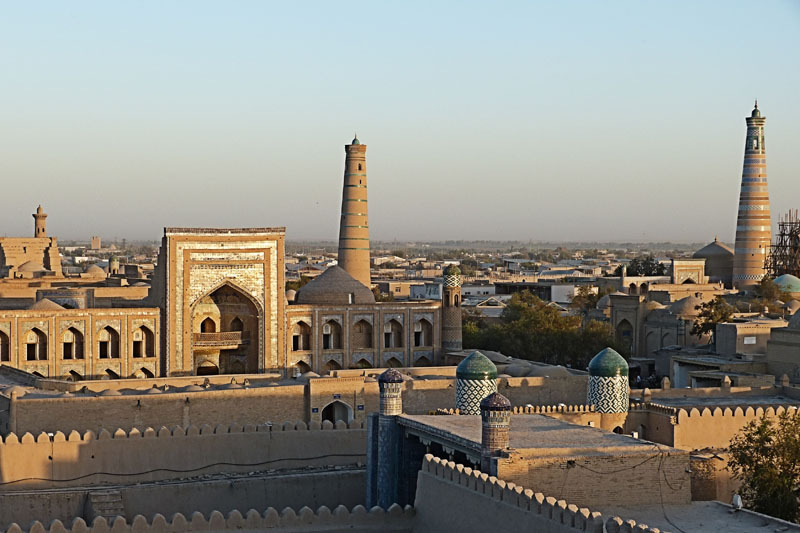 Restored and maintained exactly as it was 200 years ago, Khiva's city center Ichan-Khala is a living museum. 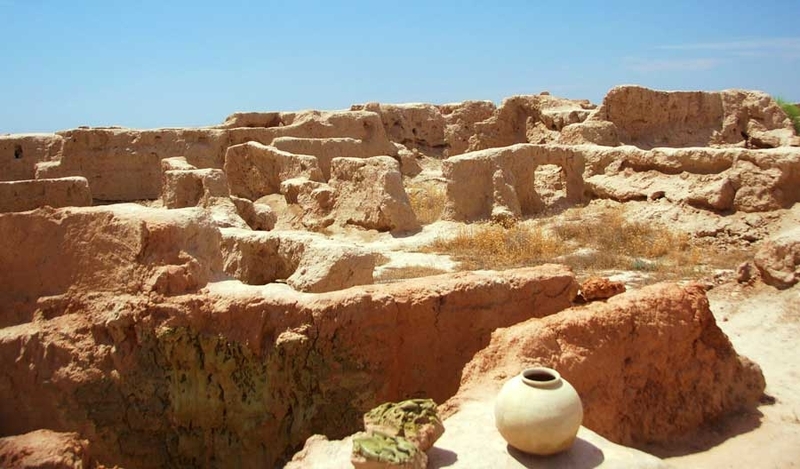 The original oasis settlement of Khorezm is was the last stop before the Kara-kum desert. In the evening the sun-baked brick walls glow with the colors of sunset and history. The buildings reflect the characteristic regional style; a muted palette of deep blue, light blue and white with vine and floral motifs, tall portals of medressah and palace, the columns of the Djuma mosque, remarkable wooden doors, and graceful minarets piercing the skyline. The Kalyan Minaret dates back to 1127, a fitting symbol of old Bukhara. When Chinggis Khan invaded he left the minaret standing, supposedly struck by its beauty. Dinner will include a panoramic view of the city in the moonlight. 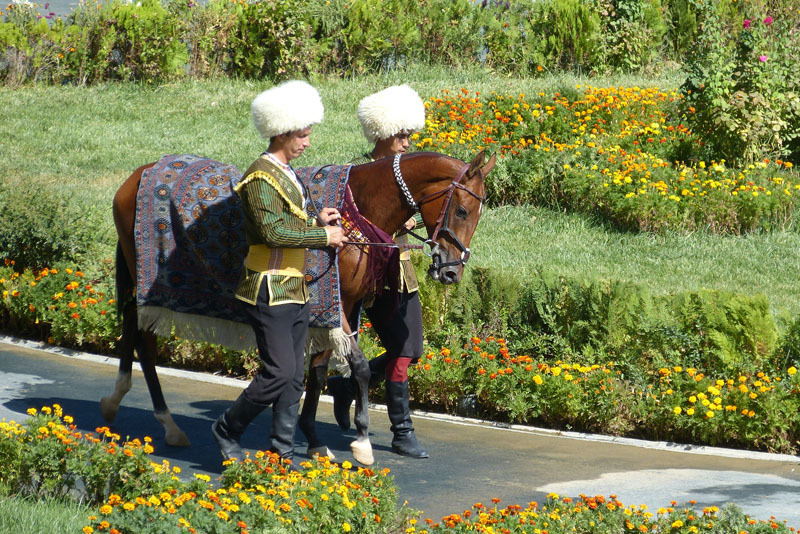 We will take an early flight to Tashkent, check in at the hotel and let you enjoy your own time in this capital city. Our guides will be happy to help you plan your explorations for the day. Choose a museum - the State Art Museum of Uzbekistan exhibits paintings, ceramics and royal costumes and the Timur Museum is known for its bright blue dome and decorated interior. More modern sights are the open-air Chorsu Bazaar, the Istiqlol Palace and the Palace of Prince Romanov ( banished to Uzbekistan for trouble with the Russian crown jewels). Shopping is available at the TSUM department store, or at a variety of upscale boutiques. After breakfast we will drive to the border with Tajikistan, and then on to Khojand. 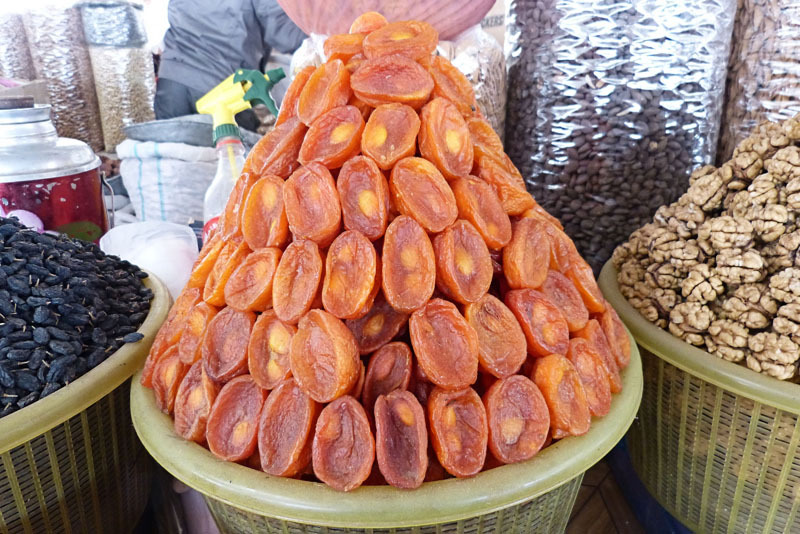 Khojand dates back to the 7th century BC and was the last stronghold in Central Asia of Alexander the Great. The second-largest city in Tajikistan, it lies along the Sir-Darya River in the fertile Ferghana Valley and is surrounded almost entirely by Uzbekistan. 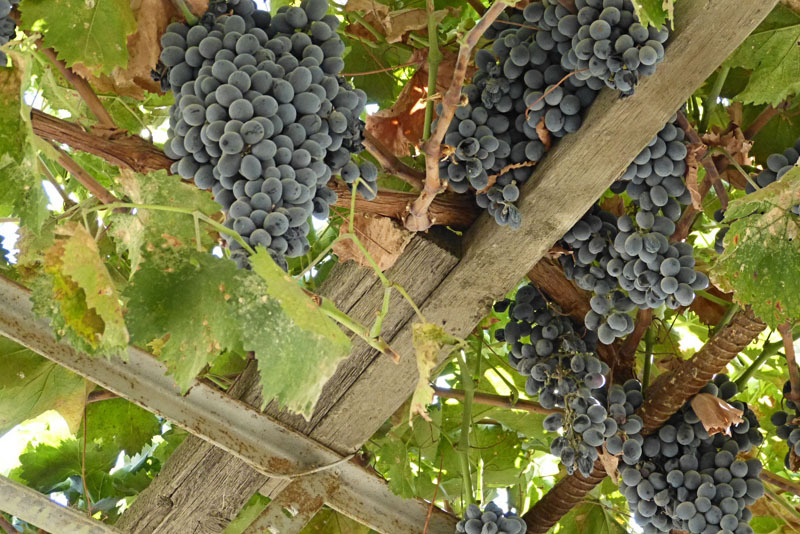 The region is known for its abundant fruit crops and mild climate. Green, shady streets, parks and gardens characterize the city and the riverside is always lively. Successive invaders throughout history left little intact and much of the modern architecture is classically Soviet. We will visit the mosque of Sheik Muslihiddin, the Temurmalik fortress and the medieval citadel, parts of which have been reconstructed. 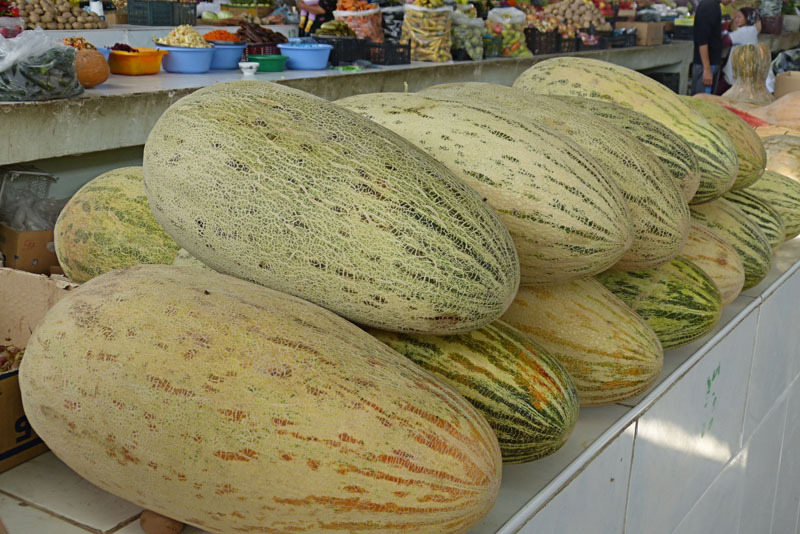 We'll see the largest covered market in Central Asia, the Panshshanbe Market, astonishing for its size and the sheer quantity of goods on offer. After breakfast we'll return to Tashkent. Today is the day to enjoy seeing the monuments and museums still on your list, search the lively bazaars for last minute souvenirs or just relax and enjoy your tea! Tonight we'll enjoy our farewell dinner in a traditional restaurant. Uzbekistan, Kazakhstan, Turkmenistan, Kyrgyzstan, Tajikistan... These are the places we long to explore, where the heartbeat of ancient civilization provides the backdrop for newly independent nations. Experience soaring minarets, desert sands, traditional silk and silver, intricate designs on ancient mosaics and hand-woven carpets, and exotic offerings at bustling bazaars. Enjoy the same warm welcome that Marco Polo received centuries ago as you travel to Central Asia! Explore the region's Silk Road treasures as you adventure through ancient alleyways and bustling bazaars! 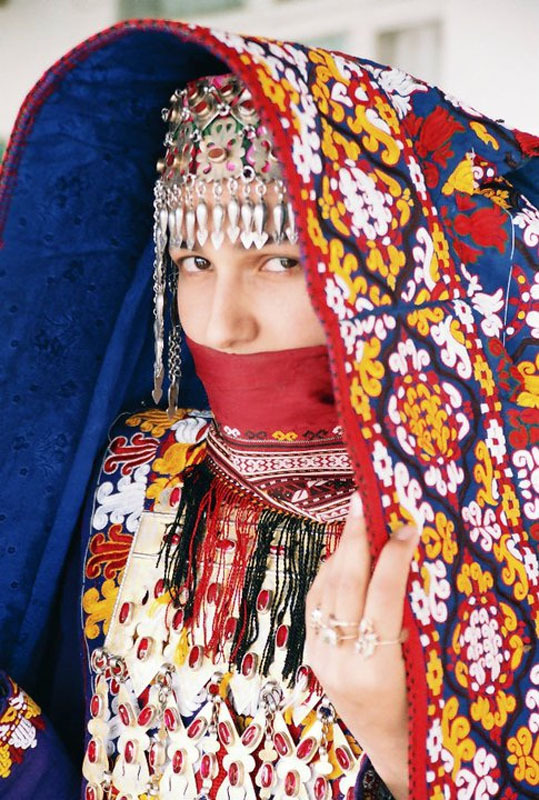 Enjoy the tribal Turkmen culture as you shop in busy marketplace and drive through ruin-filled deserts! 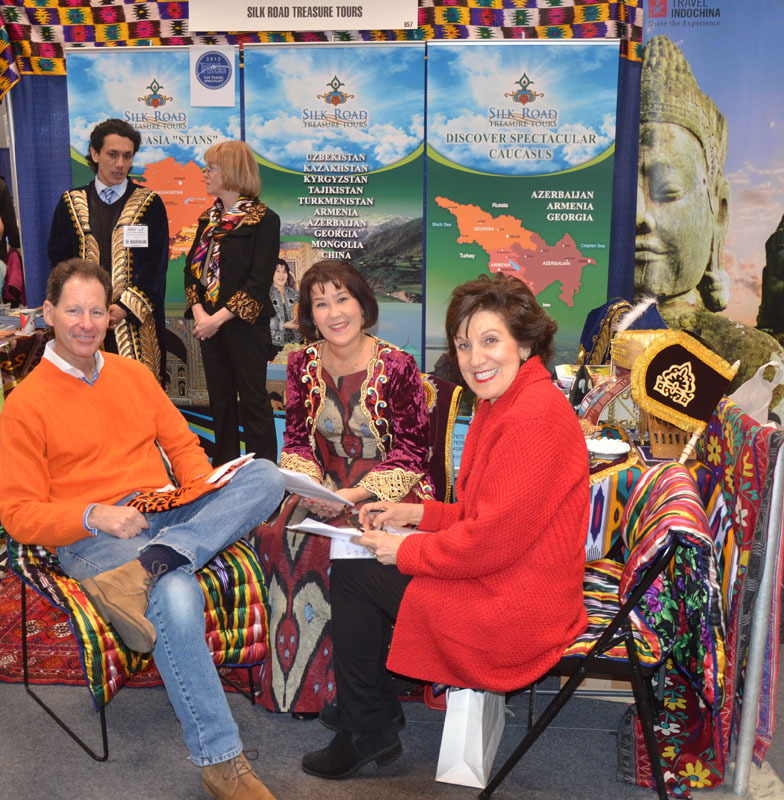 Pre-trip orientation, including detailed itineraries, what to expect, language and cultural preparation materials. An 18 day tour. Scheduled Departures throughout the year. Contact us if you are interested in a tour with custom dates.